Decoration : 12 inexpensive ways to transform your apartment! 12 inexpensive ways to transform your apartment! 12 super creative ideas for a decor that does not look like what we find in store! If you like to tinker and you like to decorate, this article will make you want to decorate your apartment and the one of your friends! Because it contains so many good ideas that you will not have enough rooms in your apartment to achieve them all! You will find in this article simple ideas that will change a room for almost nothing! Here are 12 wonderful ideas to transform your apartment, with a small budget! 1) Frame the TV with an old frame to have that romantic atmoshpere that the rooms without televisions had in old days. 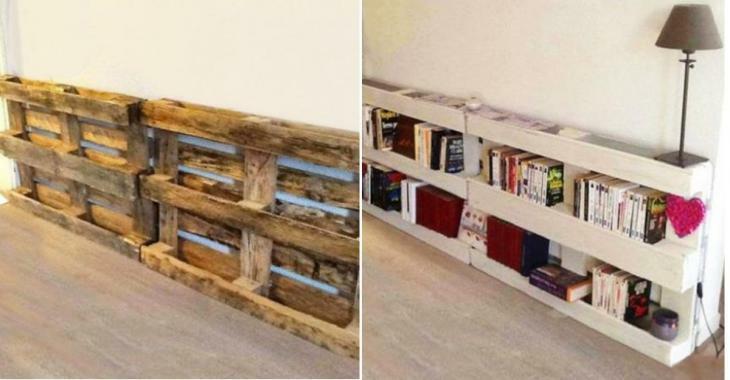 2) Use wooden pallets to create Design furniture! Do not forget that MB treated pallets are not recommended in the house. Use them as outdoor furniture. In the house we recommend the HT treated pallets. 3) Recover excess PVC pipe from your work to decorate. Make it an incredible division for the bathroom. Tubes for storage. Or even storage rings for the DIY workshop! 4) Make a rug that will steal the show! Choose a specific topic and get inspired by these ideas! 5) You can not afford a fireplace in your home? Never underestimate the charm of simple candles in a fake or true but condemned fireplace! 6) Good sanding and a little paint and you will get storage for all these books that you keep safely. 7) Photo frames and paintings will always be beautiful on the walls of beautiful decoration, but add a little more fancy to your wall decoration for this funky little side that makes you a unique person and different from the others! 8) The small white lights have this incredible power to turn any room into a super romantic decor! 9) Swirl everything, simply by adding large strips of color to the wall, floor or doors! 10) The mirror is not only good to give a visual effect of more space, it is also perfect to give a chic look to a room! 11) Modify these boring doors with simple moldings to transform an ugly room from the 80s into a magnificent room like in a castle from the 18th century! 12) At this time the chandeliers were not suspended without decoration, which are called Rosas. Beautiful spheres, more beautiful than the others. And to reproduce the same kind of effect without spending too much, make a framing with simple moldings and your room will be much more finished as well!